Home / Which Cloud Technology is Best? 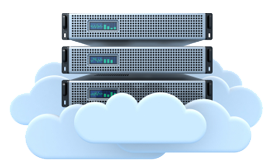 The On Premise Cloud Solution is a collection of Hardware running a Virtual Server Platform. Simply put, specialized servers configured for maximum output, with the smallest footprint possible and set up for high virtual server availability, redundancy and disaster recovery. Most businesses will start their adoption of the cloud by employing the ‘Cloud’ technology used by datacenters first. By converting physical servers to Virtual ones, a company will benefit immediately and position itself to easily off load appropriate computing systems to a datacenter. Although TCO is lower, on premise solutions often require a large capital expense initially. Cost of equipment and software maintenance. The hosted version of the private cloud moves the hardware from On Premise to the Datacenter. Businesses with many locations or satellite offices will find greater up time and accessibility of their resources. Unlike the On Premise solution, Satellite offices are not affected by internet trouble at the main office. One caveat, this architecture requires fast, redundant internet. After all, having your systems in the care of a datacenter is only part of the equation. Your users will still need the means for access. Most companies cannot yet justify the bandwidth cost for this option. Priced per month and no capital expense. Fast deployment – can spin up virtual servers in minutes. Granular control – Customize the environment to suit the need. Flexible scaling – add or adjust resources as needed. Small footprint – equipment largely hosted in secured data centers. Higher cost than public cloud options. 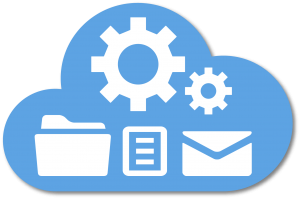 … more commonly referred to as “The Cloud” is a new way to host Email, Applications, Websites, and Data. Businesses and individuals have found that some or all of their computing needs can be fulfilled by companies who provide the aforementioned as services instead of hardware and software that must be purchased, installed, maintained, updated and backed up. Lowest cost short term and no capital expense. Fast deployment – applications are already installed. Auto scaling – resources are made available as needs change. Access applications from any internet connected device. Multi-tenant environment – several clients share the same infrastructure. This can affect performance and be difficult to remedy . Bigger target – Cyber Security can also be a concern as hackers tend to go after larger infrastructure. 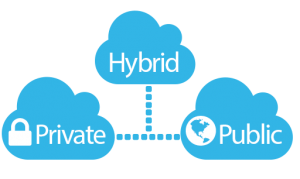 Hybrid Cloud solutions have emerged as middle ground between Datacenter and On Premise. Data can simultaneously be present on and off site. In times of on premise trouble, users can be switched to using cloud services and vice versa. This solution is the most flexible but can also be the most costly. Then again, if your company has mission critical systems, it is better to be up and pay more than down and earn much less. This is an area where proper architecture can make all the difference. Successful adoption depends largely on coordination, which is why we foster a partnership mentality when dealing with our customers. Extremely Flexible – Virtualized On Premise and Hosted Servers. 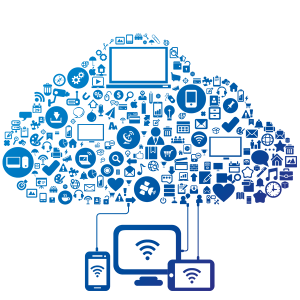 Choose which cloud service is right for each business need. Move applications and data between public and private cloud as needed. Balanced approach to security, costs and scalability. On Premise means fastest access time for employees. Use of On Premise servers require Capital Expense and maintenance. Larger footprint and higher energy costs to support On Premise solution.